The UK is becoming a pioneer in the Muslim lifestyle economy and its status as a leader in the Muslim B2C market is only expected to grow in 2018. This opens up business opportunities for budding entrepreneurs who, without offending religious sensitivities, can capitalise on the Muslim market to launch start-ups in sectors ranging from halal food to modest fashion, and much more. Combined with the growth of the Muslim lifestyle economy, in the UK a new target demographic is coming to the fore. Young, affluent Muslims – referred to as Muslim millennials or ‘Generation M’ – are looking for products and services which are both compatible with their Islamic beliefs but also in line with modern living. So, how can you maximise on the emerging business opportunities arising from catering to the UK’s Muslim population and Muslim millennials? In the UK, government statistics show the Muslim population now exceeds 3.1 million people with 1.1 million Muslims living in the capital. According to Middle East news resource site Zawya, the global halal food and lifestyle market will reach $3.7 trillion in market value by 2019. And, by 2030, the Muslim middle class is expected to triple to 900 million globally – driving consumption. Just like the growth of the Pink pound, the Muslim pound now has market influence and companies want in. Back in March 2016, retail giant Marks & Spencer (M&S) capitalised on demand for modest fashions early by launching its UK range of burkinis; swimsuits covering the whole body except for the hands, face and feet. Having already enjoyed sales in stores in Dubai and Libya, the burkinis were a huge hit in the UK and sold out within five months. Fast forward to January 2018 and M&S has just announced the launch of its first dedicated “modest” clothing range, catering for women who need ‘flowing fabrics, higher necklines and lower hems’. Fellow retailers Mango and Zara have also jumped on the Muslim lifestyle economy train, launching modest fashion ranges for Muslim women to coincide with the start of Ramadan. Start-ups are also muscling in to the fashion space, and reaping the rewards. Inayah, a London-based brand specialising in minimal and contemporary modest fashion, launched in 2012 and has become a firm favourite among Muslim millennials with almost one million fans across social media. These fans include young Muslim entrepreneur Anna Siddiqui, of Little Kickers, who tells us it has quickly become her “favourite store by far”. Outside of fashion, early-stage UK retail businesses such as The Pampered Muslimah and Ibraheem Toy House have enjoyed start-up success by targeting the Muslim lifestyle economy. The former specialises in Deen-inspired planners, stationery and accessories and has seen its Etsy store take off thanks to an army of Instagram followers, while the latter has become the world’s largest online Islamic toy store since launch in 2014. The emergence of businesses like this has paved the way for the launch of the UK’s first and biggest B2B Muslim lifestyle conference; MLE Connect. Running for its second year in 2017, the one-day London conference featured seminars and discussions on halal food, modest fashion, marketing, finance and international trade, with entrepreneurs and 200 businesses representing at the event. Delegates also came from the UAE, Turkey, Malaysia and Iran. But it’s not just the UK: The growth of new start-ups targeting Muslims in America and Canada highlights emerging opportunities for UK founders. In the last year, new brands such as Halal Socks, a Toronto start-up creating Islam-inspired socks for Muslims to display while praying, and FEJ, a Montreal start-up designing the world’s first rucksack for Hajj, have made headlines across the pond. While fashion and retail have already proved a popular focus for businesses targeting the Muslim demographic, it’s halal food which undoubtedly offers the widest array of opportunities for those looking to start a business in the Muslim lifestyle economy. And the array of halal food products and services you can offer is extremely varied; ranging from everything from halal wedding favours – like that offered by Huddersfield-based Sweeties UK – to halal street food like the Bhangra Burgers offered by Baba G’s in Camden. For budding foodie entrepreneurs, halal restaurants and pop-ups are in high demand; so much so that marketplaces such as Halal Gems and Halaleat, and review sites like the Halal Food Guy, have launched to enable Brits to discover restaurants serving up great halal food. Starting a restaurant business requires time and money though, so we’d advise piloting your halal food business idea at a street food festival or pop-up exhibition first. Street Eats, a street food festival created by Halal Gems, offers expo opportunities for halal food start-ups. 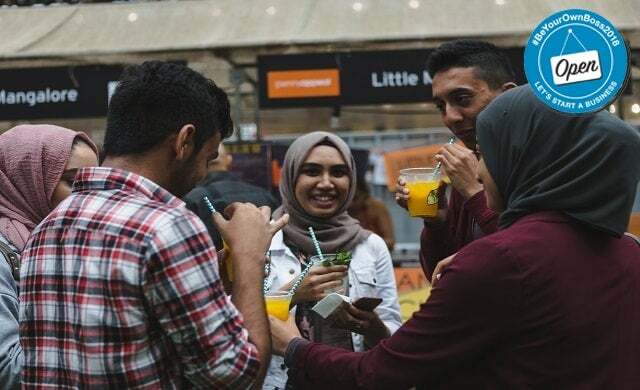 One of many successful halal food festivals in the UK designed to cater to halal-conscious diners, Street Eats launched in July 2017 and was attended by a whopping 67,000 people making it London’s largest. Zohra Khaku is founder of Halal Gems, the start-up enabling halal conscious consumers to find “beautiful unique, and interesting foodie content”, while helping the sector raise its profile “from cheap, low quality halal meat to something a bit more meaningful and ethical”. Since launch in 2016, Halal Gems has become the largest halal dining platform in the UK. Khaku tells us that the site received approximately 1.5 million page views across 2017, with 12,000 registered users on its halal restaurant finder app. “Halal food is now available in abundance. It’s good quality halal food which is cooked in innovative ways and presented beautifully that the market is looking for.